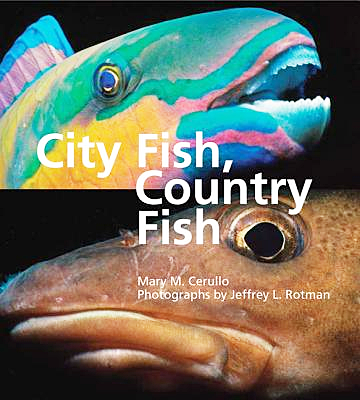 In this colourful picture book illustrated by gorgeous photographs, the author defines city fish as “tropical fishes that swim in water as warm as a swimming pool.” They live in close proximity to many other organisms and must have street smarts in order to survive. Country fish, on the other hand, “swim in cool waters, far from the equator and tropical waters.” City fish tend to use bright colours to attract mates and to warn off predators, while country fish use camouflage to blend into their environment. City fish generally stay put in well-defined areas on coral reefs, while country fish are more likely to roam the ocean in search of food, and often move in vast schools for safety. Both city and country fish use strategies to find food and avoid being food—city fish rely on specialized features or behaviours, while country fish rely more on strength and stamina. These comparisons are organized on two-page spreads with headings such as living space, working together and secrets of survival. Classroom Connections: This is an excellent non-fiction book to use as a resource for World Oceans Day. It is a fascinating compilation of facts and images that will introduce the wonders of the ocean to students of any age and help them understand how important it is to preserve and protect ocean ecosystems.